Awesome Stage 4 upgrade with Screamin' Eagle pipes and heavy breather. Check it out TODAY! This bike won't last long! 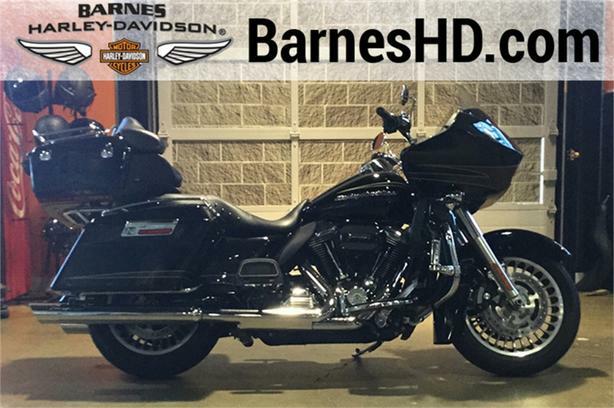 The 2013 Harley-Davidson® Road Glide® Ultra model FLTRU is a premium feature bike for your motorcycle travel. This bike will give you long-haul touring features and custom style including, the GTX saddlebags, Tour-Pak, large 17-inch front wheel, high output accessory connector, cruise control, and comfortable motorcycle seat. An air-cooled Twin Cam 103(TM) engine provides powerful performance for passing, climbing hills and riding with passengers and luggage. Also take note of the frame mounted Harley® fairing offering you dual storage compartments plus wind protection for your motorcycle travel. The motorcycle seat on the Road Glide® Ultra model FLTRU model gives comfort to the driver and any passenger. Take a minute to learn more about all the features on this motorcycle. If you're looking for a Harley® touring motorcycle with a detachable Harley® windshield check out the Road King Classic model. Classic Fuel TankPart of the unmistakable style of the Harley-Davidson® Road Glide® Custom motorcycle is plenty of room for showing off your paint. This classically styled, bold six-gallon fuel tank doesn't just give you a bigger canvas for premium or custom paint; it holds six gallons of go so you can eat up a lot more road between pit stops. We know fuel economy is important-but so is style. Sharp, eye-catching colors and crisp pinstripes that run the length of the bike from the Shark-Nose fairing to the premium GTX® saddlebags-a one-of-a-kind look for any individual soul.